oblivoir는 memoir 클래스를 이용하여 한글 문서를 작성할 수 있게 한 클래스이다. XeTeX과 ko.TeX을 이용할 수 있게 된 이래 텍을 이용하는 한글 도서의 고품위 조판이 가능하게 되었으나 적절한 안내서가 아직 충분하지 않다. 이 글은 oblivoir를 실제 출판에 이용하기 위해서 어떤 요소가 필요한지를 간단한 한 권의 책을 디자인해봄으로써 개관하고자 한다. 이를 통하여 oblivoir 사용안내서를 작성할 경우 포함되어야 할 내용의 범위를 미리 짐작해보려 한다. The session "Distribution Round Table" was held in the TeX Conference Japan 2011 on 22nd October, 2011. The object of this session was to introduce Japanese TeX distributers or packagers of each platforms, TeX distribution developers, and TeX engine developers to one another, and to share and discuss their problems. They discuss many topics by almost clarifying what is the difference between Japanese localized TeX environments and the original TeX Live environment. The topic of the updmap (update map) for mapping Japanese Kanji stood out, and the difference in Japanese Kanji mappings of the updmap would be merged in the upstream of the TeX Live. In other topics, they shared and discussed how do many Japanese TeX users typeset documents and preview the resulting DVI/PDF files with or without synchronizing their source TeX files. They also introduced that the TeX Live system has a local repository system. 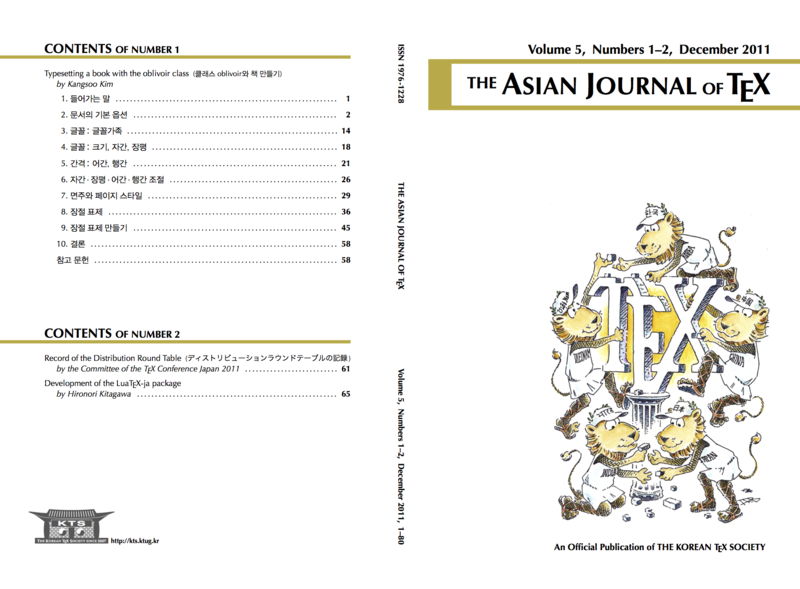 LuaTeX-ja is a macro package for typesetting Japanese documents with LuaTeX. It enjoys improved flexibility of LuaTeX in typesetting TeX documents, eliminating some unwanted features of pTeX, the widely-used variant of TeX for the Japanese language. In this paper, we describe the specifications, the current status, and some internal processing methods of LuaTeX-ja.